We have made it to the AFC and NFC conference championship games. This, of course, will bring us to the two teams that will play for Super Bowl LII. How exciting that we have come to this point in the season! Last week's games were nothing short of amazing. Who would have thought Stefon Diggs would make the winning play against the New Orleans Saints? Did you think that Jacksonville would win big again against Pittsburgh in that fashion? Let's see if we can get two more edge of your seat games this season. Who are you picking to win today? These are my thoughts on who might win each game. Let's start with the visiting Jacksonville Jaguars. The news of Patriots QB Tom Brady cutting his hand in practice might have given the Jags a sense that they have more of an advantage. Do not let the smooth taste fool you. The Jags should still prepare for that New England offense. Keep in mind, they are going up against the great head coach Bill Belichick. Jacksonville QB Blake Bortles is not the greatest, as most know. The challenges that he will face to keep the offense scoring will be many. He will need to be mistake free. Again this week, the Jags will rely heavily on RB Leonard Fournette to get them in the end zone. Although Bortles did air it a few times against the Pittsburgh Steelers with WR Allen Hurns and Marqise Lee, they will turn to the running game to sustain them. This should not be tough against the New England defense, but do not count S Devin McCourty, S Patrick Chung, and CB Malcolm Butler out. They can be just as disruptive. The Jaguar defense should be able to hold the Patriot offense back. They are fantastic against both the pass and run. With DE Calais Campbell, DT Malik Jackson, MLB Paul Posluszny, CBs Jalen Ramsey and A.J. Bouye, and S Barry Church, the Jags defense is nothing to play with. They have made their presence known. There is no doubt that they will make their move on Brady at every possible turn. The biggest test for the defense will be whether or not they can bring down TE Rob Gronkowski. There cannot be too much focus on Gronk that they take their eyes off of the rest of the field. He could very well be the decoy. The New England Patriots are just cut from a different cloth. The combination of QB Tom Brady and head coach Bill Belicheck is something no other team can replicate. They both know how to use a team's weakness against them. This is what they will have to do to get it done today. The Pats will have to rattle Jags QB Blake Bortles and cause him to make mistakes, namely turnovers. RB Dion Lewis has been a steady go to the past few weeks for the offense. Will the Jags allow a hole or gap for him to get through? If so, that will be a chink in the Jags defensive armor. One of the best things going for the Pats is TE Rob Gronkowski. He is a big guy that takes a lot to bring down. Jags CBs Jalen Ramsey and A.J. Bouye will have a tough job containing him. As mentioned before, Brady did cut his hand and it required stitches. How this will effect his play is uncertain. The idea of him handing that ball off to Lewis instead of passing it long to WR Brandin Cooks is becoming more and more like the game plan. Hell, these are the Patriots though. Is there really a game plan? Belichick is constantly analyzing, so things could change as the game goes along. Do not look for a lot of scoring here. The choice is tough to make. Everyone except for Pats fans are tired of seeing them go to the Super Bowl. This could be a first for the Jaguars. It is going to be close. It would be great to have, for the first time, a team in the Super Bowl play on their home field! This is exactly what the Vikings are trying to do. If that win last week was any indication of their heart, the Eagles are in trouble. The Vikings defense alone is enough to make most teams shake in their boots. Lead by DE Everson Griffen, the front seven have been dominate over most offenses. S Andrew Sendejo, S Harrison Smith, CB Trae Waynes, and CB Xavier Rhodes can have Eagles QB Nick Foles thinking twice before passing. On offense, the tandem of WRs Stefon Diggs and Adam Thielen combined with the talents of QB Case Keenum should keep the Philadelphia Eagles' defense on it's toes. All three can make plays when there does not seem there any to be made. Do not leave out RB Latavius Murray and TE Kyle Rudolph. They will be quite effective against the Eagles' secondary. If the defense can make trouble for Philly's Nick Foles, they could be on their way to making history. Philadelphia will have to be extra prepared. QB Nick Foles has not exactly been the missing link in the chain. He has been less than spectacular these last few weeks. The absence of QB Carson Wentz is definitely being felt. The Eagles may have to hand off to RB Jay Ajayi a little more than they would like to get points on the board. This will be a feat against the top defense in the league. Passing to WR Alshon Jeffery or Torrey Smith or Nelson Agholor could be near impossible with the cornerback coverage that the Vikes will be supplying. Timing will be everything in those passing situations. Timing that seems lacking more times than not for the Eagles. That means that the defense might be on the field a little more than they would like. Can the likes of DT Fletcher Cox, S Malcolm Jenkins, S Rodney McLeod, and CB Ronald Darby hold of an explosive offense like Minnesota's? They certainly will be tested. It will certainly come down to decision making behind center. The Eagles have managed to come this far without their star quarterback. Can they do it one more time? This pick was a little easier to make. It will be a good game though. 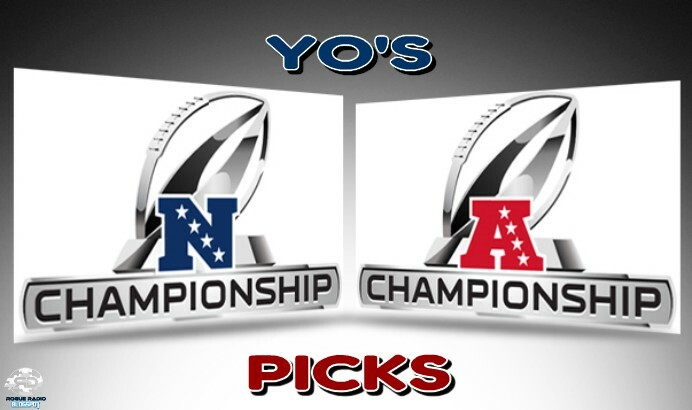 Can you make the right picks for the games? I am looking forward to some great football today! This is what football is all about. Let's see how my picks turn out this week. I did not do too bad last week. Atlanta was Atlanta so .......MEH. LOL! Good luck to your teams and picks!